New!! 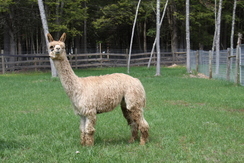 Alpaca yarn from our own alpacas in a wide assortment of natural colors. Also pure baby alpaca yarns in a variety of vibrant colors! Alpaca scarves, mittens, finger and fingerless gloves, baby blankets, hats, several varieties of socks and boot inserts all at great prices. Store hours 10 to 4 Saturday and Sunday or by appointment. For holiday shoppers we will be open Friday, Dec. 16 and 23 12 to 4 also.